Dhaka, Jan 2 (Just News): The Bangladesh Nationalist Party (BNP) chairperson, Begum Khaleda Zia, on Tuesday said her party would join the next election if it is held under a party-neutral government after dissolution of parliament. “The BNP is an election-oriented political party. We’ll take part in the polls. Even if you want to keep us out of the polls, it is not possible. We’ll join the polls and you will have to make that arrangement,” said Khaleda Zia. Also a former prime minister, Khaleda was addressing a gathering of activists of her party’s student wing Jatiyatabadi Chhatra Dal at the Institution of Engineers, Bangladesh in the capital. JCD organised the gathering marking its 39th founding anniversary although the authorities did not allow it to organise its scheduled programme in time. “Elections cannot be held keeping this parliament and elections can also not be held under [Sheikh] Hasina,” said Khaleda Zia. She alleged that her arch rival, premier Hasina-led Bangladesh Awami League (AL) did not come to power with the people’s mandate. “This government is not elected with the people’s vote and as it’s not elected, elections cannot be held under this government. There is nothing called parliament today. “Hasina made an arrangement for holding polls keeping parliament in place, in order to stay in power. None of them got votes in the 2014 elections. They are not eligible to be members of parliament, so parliament must be dissolved,” she added. She was critical of the AL government for its failure to contain the prices of essential commodities. UNB adds: Khaleda Zia alleged that a stalemate has been created in the country as everything is happening at the 'behest of the Prime Minister'. "The country can't run this way. People didn't liberate the country to be ruled by a single person." The BNP chief accused the government of forcing Chief Justice SK Sinha to quit at 'gunpoint', saying its intention is not good as it has not yet appointed the new Chief Justice. She alleged that the government is staging dramas in the name of anti-militancy drives branding innocent people militants only to get sympathy from the foreign countries. The BNP chief also alleged that the government is destroying the country indulging in widespread corruption, plundering and various irregularities in the name of development. She said though the government is dreaming of building the Padma Bridge, it can't be constructed during the tenure of the current government. "The Padma Bridge won't be constructed during the Awami League's rule. Even, if they somehow construct the bridge, please don't get on it as there'll be huge risk," she added. 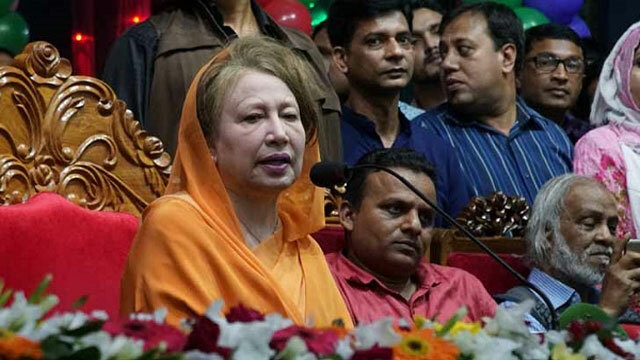 Khaleda Zia urged the leaders and activists of her party and its associate bodies, including JCD, to get united maintain discipline and chain of command to get success in their efforts to restore a people's government. She also warned that the party high-ups are observing the activities of all-level leaders and activists.